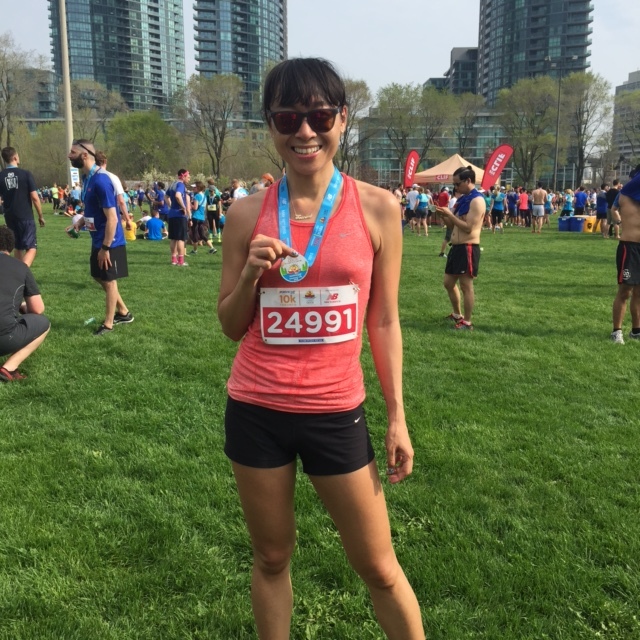 With the Scotiabank Toronto Waterfront Marathon I’m running this Sunday, I’m trying to eat wholesome meals and hydrate well (OK, I did indulge in an ice cream cone yesterday, oops!) and as I mentioned #trainwithgrains (I shared my savoury breakfast idea last week). I’m looking to get healthy carbs and protein in my diet this week, and am sticking to foods I’m used to. This is not the time to be experimenting with new ingredients and new recipes (you don’t want to have stomach issues before or on race day, after all!). 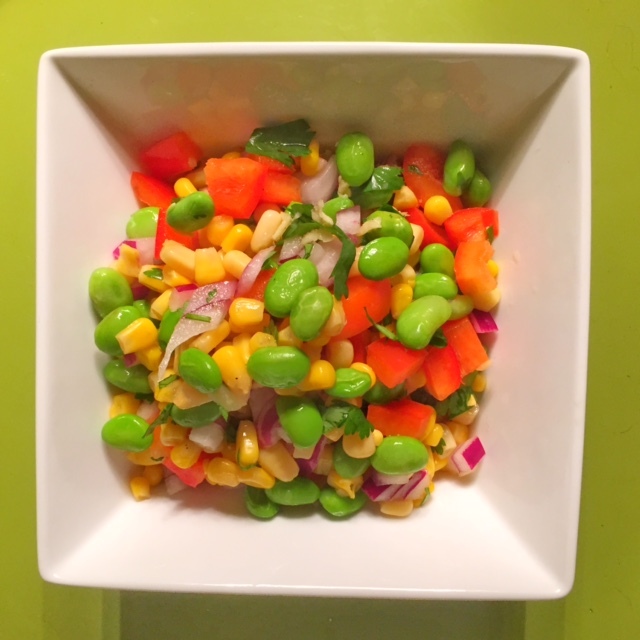 Continuing with my #trainwithgrains routine, I made this refreshing edamame and corn salad (the Self recipe is from epicurious) as a side for the filet of salmon I roasted in the oven. The only change I made to the salad recipe is omitting the mayo (it’s just a small amount but I didn’t want a creaminess in the dressing). There’s a half-cup of edamame in the salad, which equals 7 grams of protein, so it’s a great side dish to have with your meal after a run to help with recovery. Oh, I also just used canned corn as I didn’t have time to roast cobs of corn. I think roasting would add loads of flavour, though, so if you have a grill and the time, then do that. For more recipes using healthy grains such as barley, grain corn (including corn meal, flour or starch), oats, soybeans and wheat, be sure to visit the Grain Farmers of Ontario website Good In Every Grain. Sunday I ran the Sporting Life 10k race (I think it’s the fifth time I’ve run this race, I’ve lost track!). 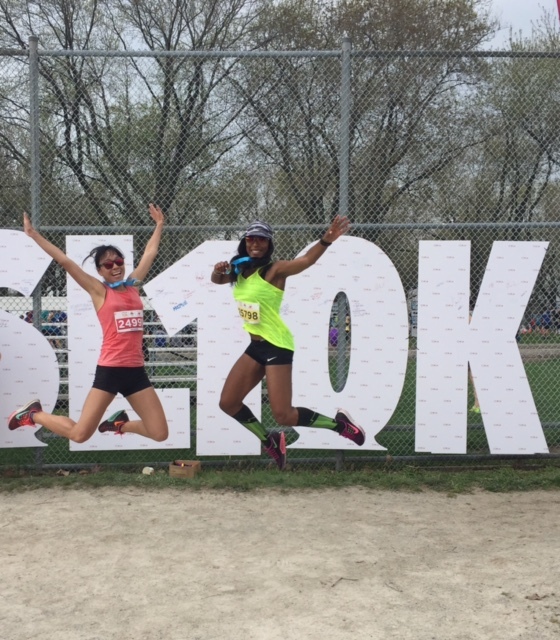 I normally haven’t been very sore after running a marathon other than the first time I ran one, but after last week’s Toronto Marathon, I felt a little more achey than usual, which made stairs a little bit tough for a day or two. I normally would’ve fit in one or two short runs in the week following before this 10k race, but I had a busy day Wednesday and was out of town with a busy itinerary Thursday and Friday. So I ended up not running at all, but that didn’t really faze me. I could tell my body could probably benefit from the recovery time. Because I was out of town, and perhaps because I’m still somewhat disappointed with my Toronto Marathon (although I got so many kind messages and congrats, which helped cheer me up), I didn’t focus very much on this 10k. I knew I hoped to PB but knew it was a long shot given the fact I’d essentially have to run the pace of my 5k time trial with Nike but maintain it for twice the distance, which I didn’t feel was likely. My heart felt like it was going to explode during that time trial. Just typing this and I can feel the sensation of it about to burst through my ribs. Add to this that on Sunday, thankfully it wasn’t raining (there had been a 60 percent chance of rain) but the weather was very warm. 18C and humid. My friend Sasha of SoSasha.com and I planned informally to run beside each other, even though I assured her she would be faster than me. We were together til about 4k and then I slowed down. 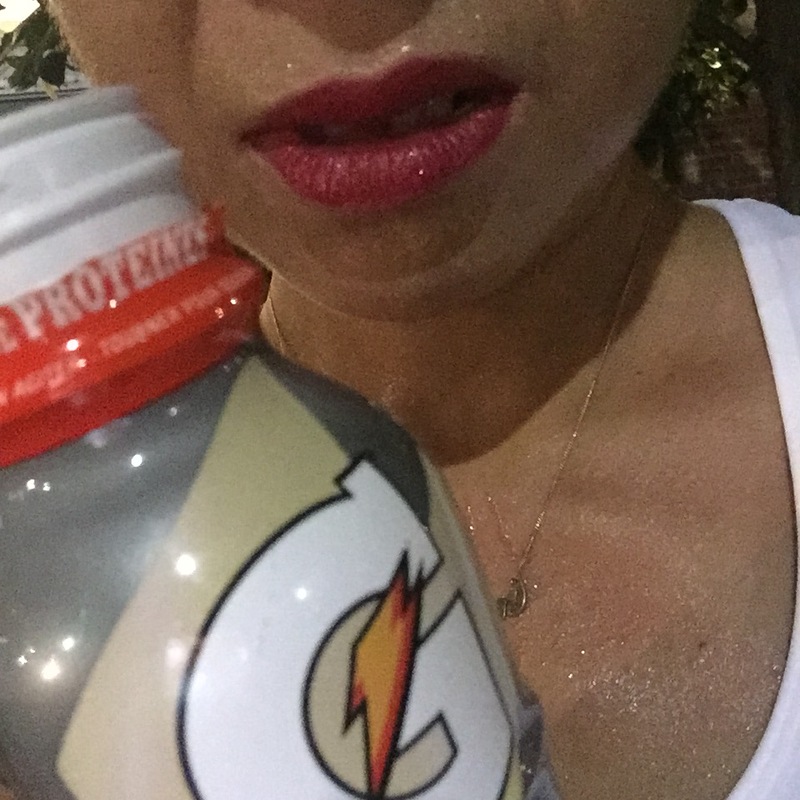 I was already feeling wiped out and was so terribly hot and sweaty. And I just couldn’t push myself more. I didn’t want to feel that intense pounding of my heart in my chest, to be honest it was a scary feeling during that time trial. At the halfway mark, if I were able to maintain the same pace, I believe that would’ve been a personal best time (I haven’t broken out a calculator to be sure, but I think it’d be sub 47 minutes)…but just like last week’s marathon, I was confident I would be unable to maintain the pace for the last half. Dripping in sweat, and not drinking very much water as I was trying not to stop running, I was very much defeated by the heat. And my splits reflect that. I ended up finishing in 49:51, which is nearly the same time as in 2013. Last year, I finished in 47:51 so I was hoping to finish this year in 45 or 46 minutes. But I’m fine with my time. This year, I don’t really feel my body or mind was as ready as it has been in the past to race again. And after having attended a barre class Monday night, I can definitely tell that my legs at least a few days of rest now after this 10k — I pushed my body hard in the last 8 days. In fact, in the photo here where me and Sasha are jumping, when I landed, my legs were so worn out and exhausted that I actually collapsed to my knees when I landed (thankfully, I didn’t hurt myself, just scraped one knee slightly). 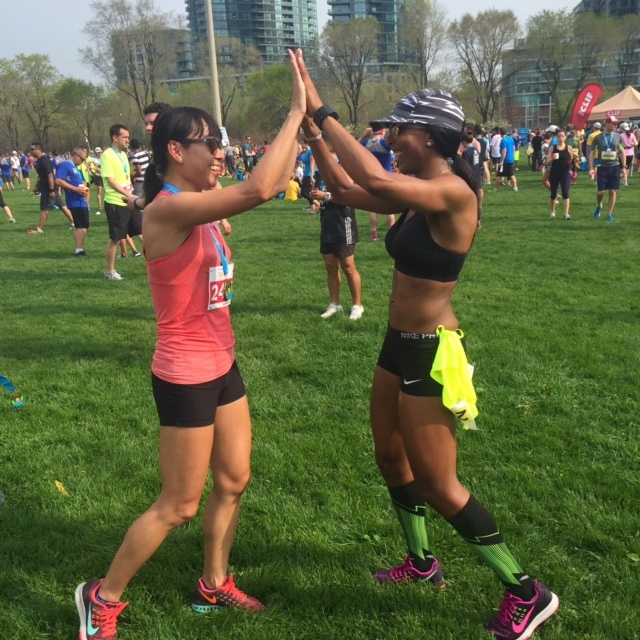 As for the race itself, it is much better organized in terms of starting in waves and the finish no longer becomes a bottleneck the way it used to when it ended in Fort York. However, I felt there were far too few water stations along the route. 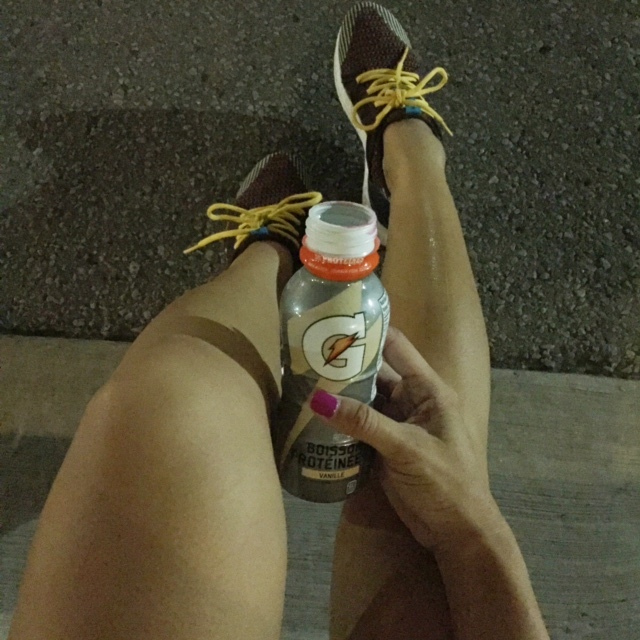 And after crossing the finish line, it was a significant walk until reaching water and Gatorade. I felt lightheaded and considered sitting on the grass until I felt more steady, but I was frightened I’d make it worse and would end up possibly needing EMS help, so I made the long trek to water and gulped down four tiny cups and several Gatorade cups and devoured two bananas. This rejuvenated me, thankfully, and I went to find my friends.